I recently had the honor of receiving the 100th review for Addiction on Trial on Amazon. I am truly honored and appreciative to all who have left such remarkable and heartfelt reviews of my book. 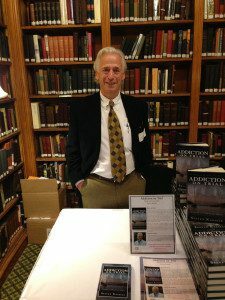 I wrote Addiction on Trial with the goal to entertain as well as educate, and I immensely enjoy hearing feedback about the impact the book is having. This blog is simply a special thanks to all the reviewers and to take the opportunity to share a few reviews that represent a theme. These types of comments have further inspired me to finish the sequel to Addiction On Trial and I will continue to work diligently to make Lost To Addiction as enjoyable and as educational as it's predecessor. Most importantly, I am pleased that Addiction On Trial is appealing to such a diverse group: lovers of mysteries and legal thrillers; followers of Crighton, Cook and Grisham; addiction professionals; folks concerned about how to educate high school students or personally touched by addiction; and page turning fanatics 🙂 A SPECIAL THANKS TO ALL !!! This Book Reads Like a Screenplay..and I Can't Wait to See the Movie! The timing of the publication of Dr. Kassel's book could not have happened at a better time. Since Philip Seymour Hoffman death, there's been a lot of long over due attention to the topic of addiction. Dr. Kassels' book is a gripping tale that graphically illustrates what the disease of addiction brings to a family, and how from there it trickles throughout the community at large. It is in all of our lives, on one level or another. His book reads like a screen play and it wouldn't surprise me if it is made into a movie one day. Plus, there's bound to be a sequel which I can't wait to read it as well. Once you pick up this book, you find yourself moving faster and faster to the dramatic conclusion. Its an absolute page turner and the courtroom drama was smart and believable! A story that keeps you guessing to the end but more importantly a raw and compelling insight into the complexity and desperation of addiction. I confess to a slight addiction to John Grisham. This was every bit as good. And the fact that Kassels is a guru on addiction gave the book a feel of substance and gave me a base of knowledge that I did not have before. It truly was interesting and enlightening. Cant wait for the next one! "Addiction on Trial" is a serious medico-legal mystery and page-turner. If you're a fan of the big names in this field like Crighton, Cook, Grisham, etc, then give Kassels a try as well. My usual complaint with the genre of "medical thrillers" is that the "medical" side of the story is usually grandiose and non-believable. Not so with "Addiction on Trial". Dr. Kassels has weaved a medical storyline that is nuanced, entertaining, factually accurate, and keeps you guessing until the very end. Well done! I'm looking forward to the sequel already! WOW, I could not put this book down. Every chapter got better and better. It was loaded with suspenseful moments just when I least expected it. I felt myself getting wrapped up in all of the characters lives and gaining a greater understanding around the challenges of addiction. Kassels is a master of valuable information and experience along with a creative powerful writing talent. Absolutely a dynamite combination. I look forward to the sequel with great anticipation. I wonder what Shawn Marks will get into next? I could not put it down, and stayed up till 3AM to finish it. Besides being very entertained, I learned much about an unfamiliar realm. The book casts a new and sympathetic light on a problem we tend to relegate to unfair stereotypes. Dr. Kassels weaves a captivating mystery thriller that takes the reader into the entangled world of drug addicts. He not only skillfully shows the emotional havoc drug addiction creates for the individual, his or her family, and the community at large, but also explains the medical and legal implications of the disease. I think young people would greatly benefit from reading this book and suggest that it be required reading for high school health classes. Addiction on Trial was a great read and I breezed right through the book. The story line, the characters, their interactions and the author's descriptions throughout kept me engaged. I came away with a better understanding of what doctors and nurses go through in emergency room settings, and the helpless feeling many families have when dealing with addiction issues. The timing of the release comes when coverage of heroin overdoses has taken off. Over prescribed, expensive pain killers morphing into heroin have become a challenge to treatment and rehabilitation. This book gives an accurate account of the perils of addiction and how it affects many lives. By bringing awareness to addiction, Dr. Kassels is shedding light on the problem without being preachy or judgmental. His book is a great vehicle for opening discussions about a topic that is obviously wreaking havoc on all walks of life. Fantastic, smart, captivating, frustrating and so satisfying! Fantastic read! Where do I begin? A close loved one was/is affected by addiction, so years ago I started reading blogs by opiate addicts--both active in their addictions and in recovery. I was trying to understand more about the experience of addiction itself and the recovery insights that survivors could share. I learned that addiction IS a disease, harm reduction helps keep more people alive to have a chance at recovery, and maintenance treatment is an important, valid, effective and "respectable" path to being a functional, happy, healthy person. I eventually stopped reading the blogs, but I am still fascinated by the topic. Imagine my excitement when I found that an expert in addiction treatment wrote a novel about this! Addiction on Trial gives a deeper look into the larger world around an addict: family, relationships, medical treatment and the legal system. It's a fascinating thriller--and so frustrating (and real!) to see how addicts can be their own worst enemies, by trying to do what's "right" for themselves and other addicts. It's heartbreaking to see how a community will judge addicts, when it's a harder experience than any of us can imagine. The characters are also so fascinating! Each one has their own motive, and they work perfectly together to form one cohesive mission. More like two sides at war, actually. If you have any interest in addiction, or you just enjoy legal or medical thrillers, this is a great read. Riveting and Educational! Fantastic Read! As a licensed addiction treatment professional I am always looking for information that can help educate the public about the issues of addiction and recovery. This book is the ideal balance of providing basic education on addiction side by side with understanding the human side. Dr. Kassels does this exceptionally well by blending them in a way that keeps the reader engaged and informed at the same time. This is a must read that should be in the arsenal of all treatment professionals! Rarely would I give a book five stars and I have been meaning to review this book for months, I loved every aspect of this book and really it should be characterized as Literary Fiction because not only was I engaged and entertained, I was thoroughly educated as well. I heard the author today on NPR and his passion and his dedication reminded me that I needed to write this review. Without question it is a five star winner. Posted in Author Blog. Tags: Addiction, Addiction Advocacy, Addiction Advocate, Amazon Reviews, Cook, Crighton, Grisham, Legal Thriller, Medical Thriller, Recover, Steven Kassels, Treatment on May 20, 2015 by skassels.